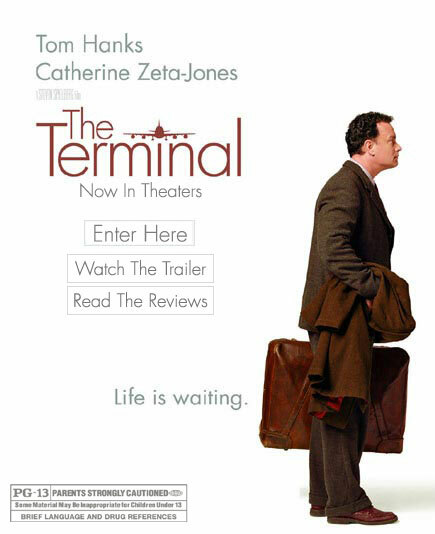 “The Terminal” is about a man named Viktor Navorski who flies to America and attempts to go through customs into New York. As it turns out, his native land of Krakozhia has undergone a coup while his plane was in flight and now the United States doesn’t recognize the new government so he is denied access to the US. Even worse, he cannot return to his home land and so he gets “stuck” in the international zone of the airport for 9 months. This setting provides fertile ground for comedy, though it takes too long to get through the setup—I found the first 30 to 45 minutes to be on the boring side. It picked up after that as we get to watch as Victor tries to adapt to living in the airport. There’s also a cheesy love story revolving around Catherine Zeta Jones and another involving one of Victor’s airport worker buddies and the woman who denies his visa every day. Victor’s buddies have lots of character—For example, the Indian janitor is entertained by getting the floor wet and then setting up “wet floor” signs in high traffic areas and then watching people ignore the signs and slip and fall. “The Terminal” is a decent film, but don’t go expecting something revolutionary.